Meet a manatee, see photos and videos of recent sightings, get Q & A, and more! Chronic exposure to water temperatures below the mid 60s F leads to cold stress in manatees. Get more facts. Report cold-stressed manatees. He has been returning to Blue Spring State Park since he was first identified. Howie is one of the most popular manatees at the park, and he has developed a reputation as a mischief-maker. Learn more. For a perfect and personalized gift, Adopt-A-Manatee® this Valentine’s Day from Save the Manatee Club. A free manatee heart ornament is included with adoptions of $35 or more. Share your love. Watch a funny video of a manatee. See Aqua and Annie and their calves, and Phyllis and her entourage check out the underwater webcam. Plus, get recent photos of the Blue Spring adoptees! View now. Q. How far can a manatee swim in a day? Get the answer in a video from Manatee Specialist Wayne Hartley. Send your manatee question, and if we feature it, you'll get a free 2019 calendar! 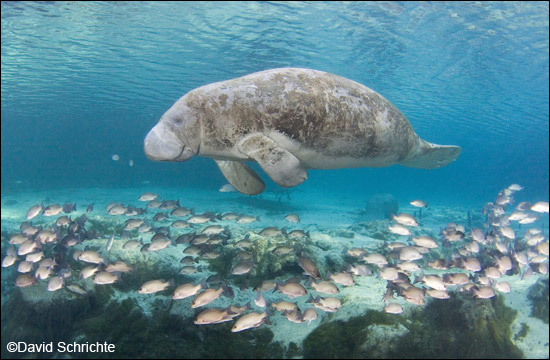 Photo Credits: It's A Fact ©David Schrichte; Meet A Manatee: Howie ©Cora Berchem, Save the Manatee Club; Manatee Heart Ornament by Kevin Rowley; Manatee Sightings ©Cora Berchem, Save the Manatee Club; Manatee Q & A ©David Schrichte. Photos and illustrations can only be used with permission. Contact Save the Manatee Club for more information. emails from Save the Manatee Club.